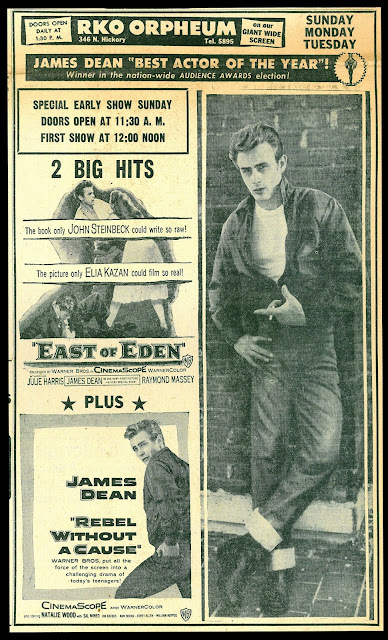 After years and years of seeing and reading a lot about James Dean and his movies, I still don't get it. I have never been impressed at all with anything that Dean has done. I prefer in EAST OF EDEN Raymond Massey's performance as the one that actually engaged me in that movie. REBEL is by far a much better movie but nowadays it feels more clichéd than it probably was at the time of its release. There was even a tango devoted to Dean recorded by RCA VICTOR that opens with the voice of an imitator in English saying something rather stupid. It is no classic but Orchard Music had blocked an upload to YouTube, but some people can manage to unlock it. Not me, it is not among my favorites. I was not captivated by JD. My socks never knocked off by his performances. Maybe I double knotted my shoe laces. But I subscribe to your feeling that LEONARD ROSENMAN's stimulating music lifted Dean up as much as his reheated Brandoisms and odd good looks. I think too that this was directly due to Dean. The story I recall is that Rosenman was giving Dean music lessons, that is to say, piano lessons. I think they'd been introduced in NYC. 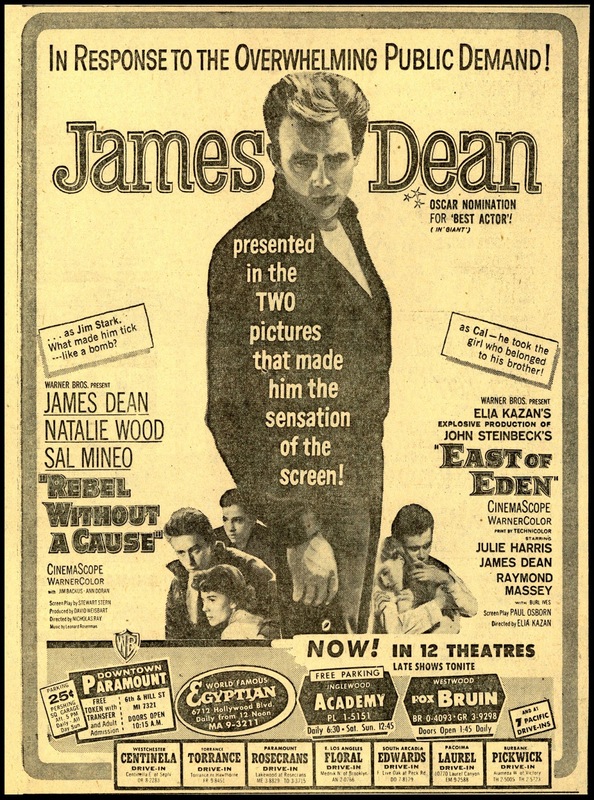 Dean, I believe, pushed for Rosenman to be hired to do the score to "East of Eden", which is pretty amazing considering it was his first big break (though not his first movie, as he's in a bit in a thing with Rock Hudson, some U-I comedy I've seen). However, Elia Kazan's films show a pattern of his willingness to give new composers a swat at Tinsel Town, including Alex North on "Streetcar Named Desire", and David Amram on "Splendor in the Grass" (though I don't know if this landed before Amram's nice score for "The Manchurian Candidate"...?) Rosenman's ability to write a pleasant, gently rocking tune that evoked a lullaby for "East of Eden" and integrate it with extremely dissonant and, for '50s audiences, probably cacophonous passages equivalent to the proverbial nails on a blackboard speaks well for somebody, at least, politically drawing a line in the sand as far as the music staying in the picture. As did Rosenman, remaining in the mix for another several decades. I was very fortunate to meet him at my friend Taylor White's store, Creature Features, in the '90s. He made an appearance there autographing copies of the freshly-released (at that time) Film Score Monthly CD of "Fantastic Voyage". I was able to speak with Rosenman and found him to be a very approachable guy. Sadly, he eventually succumbed to Alzheimer's, a terrible and sad irony for someone with such a brilliant mind and fascinating talent. His signature 'pile of fourths' ending(s) to his score(s) are unmistakable. Think of the finale to "East of Eden" and even "Fantastic Voyage", itself. I must confess that when I saw the long-anticipated (because of being effectively promoted with well-placed teaser publicity) "Fantastic Voyage" in 1966, I was a bit put off by the nearly 'tuneless' and, to me at that time, arcane and sophisticated sounds Rosenman created for the voyage through the vessels of the human body. Today, however, I think it's truly 'fantastic'. And I like the decision, probably his, to forego music all the way from the beginning of the film to the point the microscopic submarine Proteus is finally injected into the bloodstream. He effectively modifies the atonal sounds as the surviving crew are brought back to normal size by insinuating more traditional consonant harmonies 'till he's able to insert conventional fanfares that signify, to any routine moviegoer, "everything is O.K. now", or simply, "triumph", and also constitute a jubilant release from the almost non-stop anxiety and atmosphere of awe mixed with alienation he's evoked up to that point. 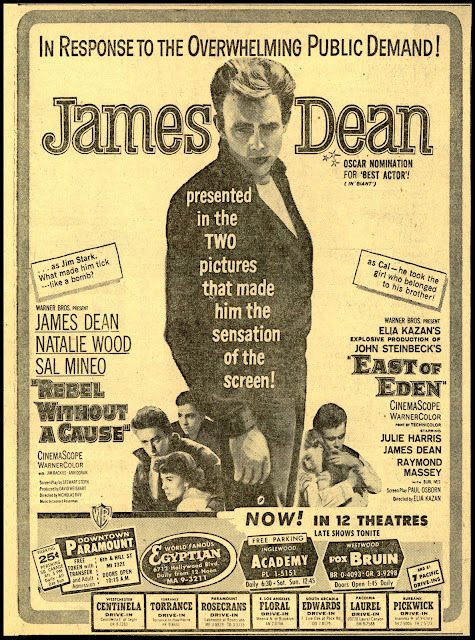 It's an ending as stirring as the one for his first score for James Dean's effective debut. Stinky would sooner watch The Black Scorpion. By coincidence, during some recent research I came across this pairing at the NY Paramount theater. I found it odd then realized that the Paramount was in the process of re-inventing itself by dropping the famous, and certainly expensive, stage show and booking quite a bit of the current hot product - 50's horror/sci-fi. For example, they would open Hammer's The Curse of Frankenstein with a midnight screamiere. 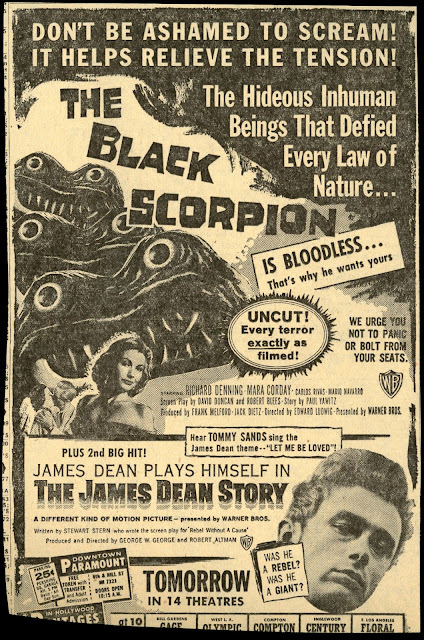 After the first week of The Black Scorpion, The James Dean Story appeared as a double bill. To my knowledge the first and last time that the Paramount booked a double feature. Thanks for this info on the Paramount Theatre, Jerry. I have seen photos of the marquee when they played "The Curse Of Frankenstein." In fact, I think "Band Of Angels" ran the week ahead of it. 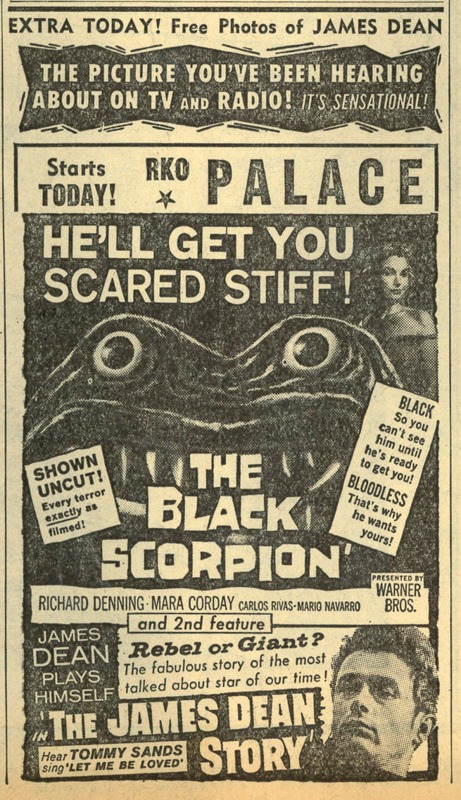 Warners knew how to get Class A dates for the horror/sc-fi they produced and/or distributed. We think of "The Black Scorpion" as smaller change today, but it was big stuff in terms of bookings back in 1957. Wish I had been old enough to be there. I felt your keen observation about the importance of Leonard Rosenman's music to EDEN and REBEL was extremely cogent. Craig Reardon's post further discussing Rosenman's work was excellent; his reflections on the composer's FANTASTIC VOYAGE score were spot on. The Rosenman scores for EDEN and REBEL are quite beautiful and musically ambitious. I gather the soundtrack album you mention is A Tribute to James Dean: Music From Giant, East Of Eden, Rebel Without A Cause, which Columbia issued in 1957 and has remained generally available through the years. [I bought a Columbia Special Products lp version in the early '80s; Sony released this on CD in the early '00s.] This is not really a soundtrack album -- this is a re-recording of Rosenman (and Tiomkin) themes conducted by Ray Heindorf and played by the Warners orchestra. The EDEN cuts are excellent and very reminiscent of the film recording; I was less pleased by the REBEL tracks (interestingly, there remains some question as to whether Rosenman or Heindorf conducted the score for the film itself). The three selections from GIANT seem to be there for completion's sake (Capitol had already released a best-selling album of the Tiomkin score), though they seem to receive top-billing on the jacket. 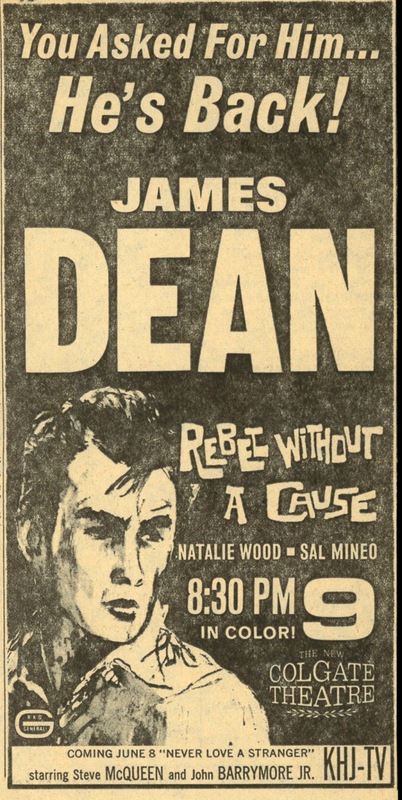 It may be a movie with a very small cult, but I am a big fan of James Bridges' SEPTEMBER 30, 1955 (originally titled 9/30/55), a really unique film about the impact of Dean's life and passing on a young Arkansas college student (Richard Thomas as a character clearly based on Bridges himself). This picture explores some ideas -- in a very original way -- about how art (in this case, the movies) can inspire, influence and even provoke. * This is a greatish work (beautifully photographed on location in Arkansas by Gordon Willis; the dvd doesn't do his camerawork justice) which has remained in my memory. Bridges was given a lot of freedom and leeway to make the movie his way, and he was able to hire Leonard Rosenman to score the picture, the ideal choice. Rosenman very sensitively adapted and revisited his EDEN and REBEL scores in scoring Bridges' film. There's a very, very long and brilliant cue near the end of the movie during which Thomas' character is explaining going to see the then-new REBEL WITHOUT A CAUSE; it starts with EDEN themes and very gradually and subtly segues to themes from REBEL. The final music heard in the film, a re-orchestrated REBEL theme led by a lonely saxophone, that runs under the end credits is deeply affecting. * That said, Bridges had the same luck as most moviegoers in the '70s in terms of accessing a correct presentation of EAST OF EDEN. At the beginning of the movie, Richard Thomas watches a pan-and-scan print of EDEN in an Arkansas theatre. Perhaps Warners had no 35mm 'Scope materials on hand for the picture for the filmmaker to borrow. 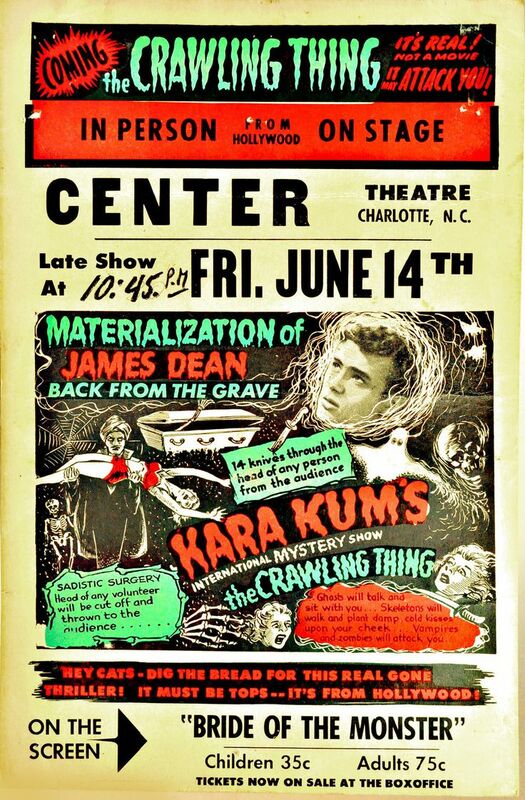 That "Crawling Thing" poster is certainly a wonder of kitsch. (Where in Charlotte was the Center -- was it the theater on Tryon Street across from Ivey's?) The "sadistic surgery" stunt had to have been done with a planted shill, who resembled the "severed head" that was tossed into the audience. Didn't Leonard Rosenman score "Edge of the City"? Loved the opening theme to that film. I remember seeing ads and commercials for "9/30/55" when it was released. I also recall a TV-movie about Dean, written by William Bast about their friendship, with Jeff Goldblum as Bast.